Last month, I told you about biking halfway to Mexico. Yesterday, I had the pleasure of biking halfway to France. I borrowed a bike from Lausanne's free bike rental program and headed along the lake to Vevey, about 10-12 miles away. It looks like if I had continued around the circumference of the lake, another 10-12 miles would have put me in France. I suppose biking all the way around the lake would make a good vacation, but since all I had was a free day after four days of conferences, this trip was a nice diversion. I should have taken the Metro to the Ouchy station near the lakefront, but I let the guy talk me into riding my bike. Of course, I couldn't understand his directions in broken English and ended up riding all over the place before getting out of town. 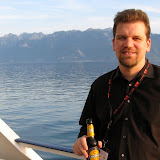 When I got to Vevey, I visited the tourist information center, ditched the bike, and headed out. The woman in the information center claimed that there was nowhere to lock my bike, but that I didn't need to. She also sent me to a mall when I asked about souvenirs, so I'm not sure of the quality of her advice. I locked the bike to a sign, which seemed to work. I had lunch at a Thai restaurant, bought some postcards and visited Charlie Chaplin's grave. All in all, a successful visit. On the ride back, I tried to minimize my detours, not entirely successfully. I had an idea of leaving my bike at Ouchy, then returning for it via Metro after rush hour was over. I really wish I had done that; I meandered all over town trying to find a good route back to Roule Lausanne. Eventually, I did and left tired after my longest bike ride yet. I should note that both the tourist information center and Chaplin's graves are waymarks, which allowed me to find them more easily. I now have the "grave of a famous person" category. While that doesn't help me with waymarking bingo, it does bring me up to 251 waymarks. Also, the Lavaux vineyard terraces are a World Heritage Site, which makes them the 46th that I have visited, and the 2nd for 2009. 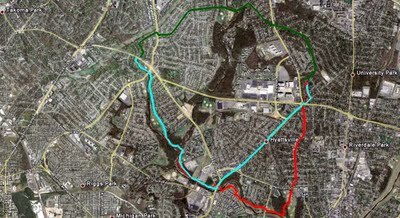 I've been trying to find a good bike shortcut to Takoma Park and Silver Spring. Driving, we have a more-or-less straight shot up East-West Highway, but that isn't suitable for driving. And once I get close, the Sligo Creek Trail and various on-road bike routes make things easy. But it's tricky handling the distance between home and where the East-West Highway hits Sligo Creek Trail. Fortunately, I collect lots of data about my rides, so I can make both an objective and a subjective comparison. 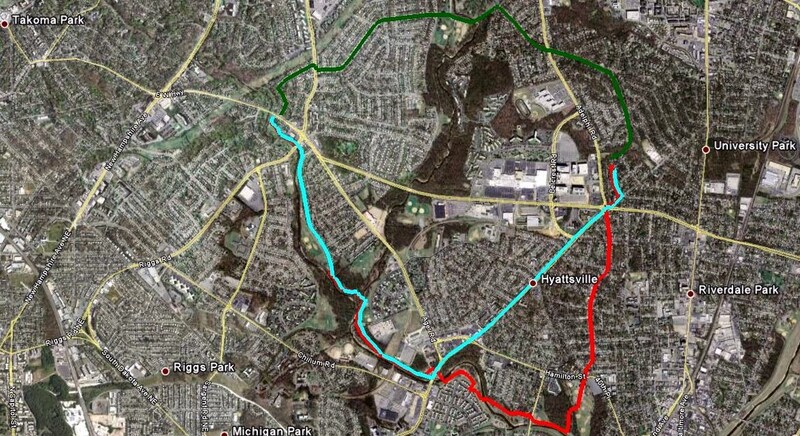 My first attempts (red path) were done by going south through Hyattsville and Magruder Park and taking the Northwest Branch Trail to the Sligo Creek Trail. It's somewhat roundabout, but it's all easy biking on either residential streets or a scenic set of trails. Time: 31 minutes. Distance: 4.6 miles. From the first time I looked at the map, I had my eye on a route via residential streets to the west of home (green path). Christina and I explored the route via Wells Parkway and Wells Boulevard to a park we call "Stolen Mulch Park". (The first time we drove by, we saw some women helping themselves to some mulch that had been clearly placed for park use.) One day I decided to push through along the route marked on my bike map. Unfortunately, this route involves crossing Riggs Road, but not at a crosswalk. Riggs Road is fairly busy and doesn't feature many lights or crosswalks. It does have a median, so I did eventually get across, but it was not fun. The only thing this route has to recommend it is that it is the shortest-distance one I tried. Time: 25 minutes. Distance: 2.9 miles. When I looked at the map again, I saw Queens Chapel Road marked as a bike route (blue path). I had been fairly skeptical, because I know Queens Chapel is fairly busy outside of University Park. When I rode down it, however, I realized it has a nice, wide shoulder. Except for a small segment where people park cars on weekends, it's fairly easy to avoid most traffic before picking up the Northwest Branch Trail. It's a bit hillier than other routes, and not as scenic as going via Magruder Park, but it's the fastest route, and it doesn't involve any scary intersections. If I'm trying to make it farther into Montgomery County, I'll definitely take this path; if I'm looking for a more leisurely ride, I'll probably go via Magruder Park. Time: 22 minutes. Distance: 3.6 miles. This analysis may seem like overkill for differences of at most 9 minutes or 1.7 miles. But those differences are doubled for a round trip and definitely make a difference between a reasonable ride and one that leaves me feeling wiped out. So, until the county wises up and builds a better path, I think I have the information I need. Cairns, born Aug. 9, 1880. Gaytonwood Farm appears to be a campground now; here is a picture.